All NCS scholars participate in hands-on science every day, and conduct over one hundred fifty experiments each year. 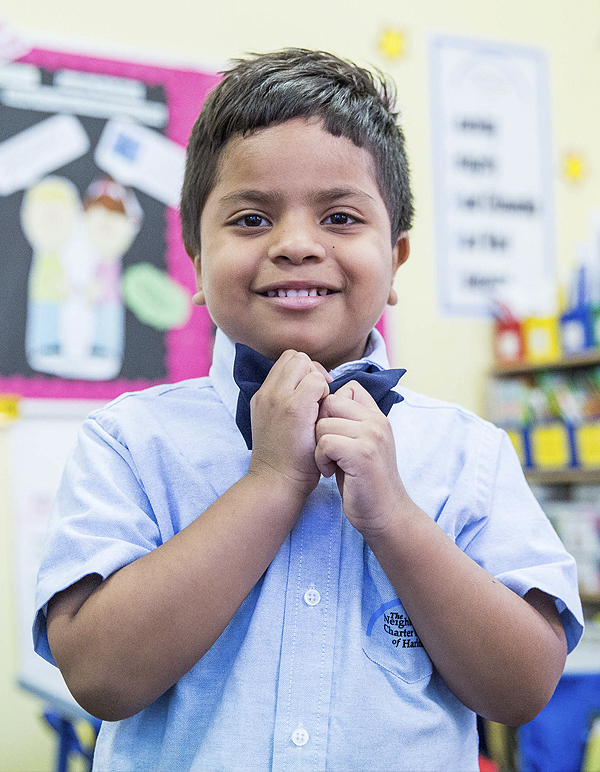 Our academic program focuses on making sure that all of our students are fluent readers and confident writers, that they have solid math skills and that they are well on their way to becoming independent learners and critical thinkers by the time they reach third grade. We do this by combining intensive direct instruction in math and literacy skills with opportunities for independent work, creativity and problem solving. Our students also study science, history and geography using engaging curricula that will build on their natural curiosity, give them a firm foundation in these subjects and reinforce independent learning and critical thinking skills. The arts, physical educational and social and emotional learning are also integral parts of each school day. NCS uses a balanced literacy approach to teaching language arts that includes interactive reading of shared texts, guided reading in small groups and independent work. During the course of a day, teachers conduct a reading workshop, writing workshop, and phonics and vocabulary development. Students read a large variety of rich texts, both fiction and non-fiction. Our math curriculum provides students with the opportunity to develop a conceptual understanding of mathematics while developing the foundational computing skills that are needed to solve mathematical problems. Students are taught to use a variety of mathematical strategies to solve problems. During math workshop we use games and a variety of mathematical tasks to help students learn to take ownership and responsibility for their mathematical learning. To cultivate problem solving, we use Cognitively Guided Instruction (CGI), which helps our students develop a deep and thorough conceptual understanding of mathematics by solving everyday problems and then sharing their solutions with one another. NCS students have laboratory science every day taught by a dedicated science teacher. Our science program was designed on site, is inquiry-based and teaches students to build on their own natural curiosity. Students participate in over 150 hands-on experiments each year. NCS has two certified physical education teachers who provide classes for all students. In addition to physical education, students have recess each day and time built into their schedule for stretching and movement. Healthy meals and snacks are provided by Revolution Foods. Each school day ends with scholars engaging in cooperative play during a period of the day called Choice Time. Enter any NCS classroom between 3:25-4:00 p.m. and you will find our scholars playing board games, drawing or creating structures out of clay. Our kindergarten scholars have a room dedicated exclusively to block play. Scholars build skyscrapers, trains, or anything that sparks their interest. They have equally as much fun explaining their creations to their classmates. LIGHT Squad at NCS is a laboratory for exploring, observing, and investigating the LIGHT values (Learning, Integrity, Good citizenship, Hard work, and Teamwork) that are integral to the NCS community. LIGHT Squad creates a safe environment in which scholars are able to engage in personal exploration, restorative dialogues, positive relationship development, and conflict resolution. Through exploring and practicing these values in a welcoming and receptive space, scholars will develop a sense of fellowship with not only peers in their Light Squad, but also in the larger NCS community. Developing a sense of community and fellowship within the walls of NCS is essential to the academic and social-emotional growth of each student. It is equally important to cultivate scholars who are active members of the outside community. Light Squad will allow scholars to hone their skills as empowered activists and volunteers, while further encouraging their ability to be leaders during town hall meetings, school events, and activities. All of these efforts will help scholars to become engaged members of a community. Each LIGHT Leader (advisor) serves as a point person for all areas related to scholar academics. 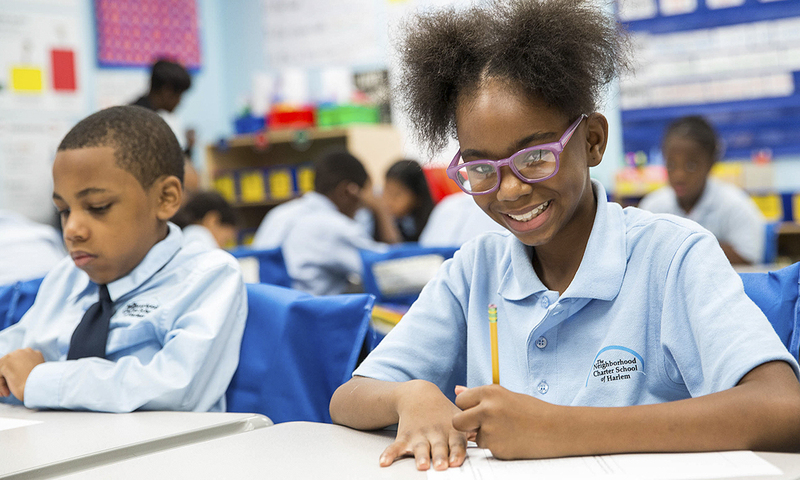 Leaders will assist scholars in developing ownership and agency over their academic progress, which will be displayed through scholar-led conferences. Leaders will guide scholars through the process of reviewing, assessing, and comprehending their academic progress. During conferences—which occur between Squad leaders, scholars, and caregivers—scholars will take responsibility for leading an honest and thorough discussion regarding their overall performance. Each day begins with a grab-and-go breakfast followed by electives, which students select. It’s a great way to start the morning. A few electives we offered in the past are: comic book making, robotics, arts and crafts, dance, and drama. NCS has an arts department and depending on the grade level, our scholars receive instruction in visual arts, performing arts and dance. Social and emotional skills are just as important as academic skills for success in school and in life. These skills are explicitly taught, modeled and reinforced throughout the school day beginning with a morning meeting that emphasizes attentive listening, sharing and learning to appreciate the exchange of ideas. A daily choice time period makes use of the arts to teach students to explore, create and work together while increasing their self-awareness, self-management, relationship skills, decision making and problem solving. Technology is built into every part of our school day. All classrooms, including our Science labs, have Promethean Board technology. Additionally, one mobile iPad and three Chromebook carts are available for classroom use and are used by students to research topics on the internet.